Dudley is what I would call a working man’s town. Although today it looks a little run down, just a brief glimpse around shows the signs of the West Midlands’ proud industrious past. From a football perspective the town may appear to hold very little. A couple of non-League clubs, one of which, Dudley Town, famously had to vacate their ground when a disused coal mine collapsed close by. In fact if you took a poll of the townsfolk most would pledge their allegiances to either West Bromwich Albion or Wolverhampton Wanderers. However, Dudley can proudly boast of being the birth and indeed final resting place of Manchester United legend Duncan Edwards. Born on the 1st October 1936, Edwards signed for Manchester United in his early teens. Both Aston Villa and Wolverhampton Wanderers were keen on signing the youngster but he joined United claiming it was the club for which he wanted to play. Wolves manager Stan Cullis was particularly bitter at missing out on such a rich local talent. He made various allegations towards the Manchester United management about the way they had allegedly enticed Edwards to play for them. Both United and Edwards rebuffed Cullis’ claims. On 4th April 1953 at the age of 16 years 185 days Duncan Edwards became the youngest footballer of the time to play in the First Division when appearing for United during a 4-1 defeat to Cardiff City. A year later he was selected for England, making him the youngest since the second world war to represent his country. In a career that lasted just short of five years Duncan Edwards made 177 appearances for Manchester United scoring 21 goals, he also represented England on 18 occasions netting 5 times. On the domestic front Edwards helped Manchester United towards two First Division Championships, an FA Cup final and a European Cup semi-final. My dad, who had watched much of his early football at West Ham, a club renowned for producing quality young talent, was as good a judge as any of great footballers. I remember him telling me about the time he witnessed one of Edwards’ displays in a match played at Arsenal. He told me how he could not quite believe that Edwards was so good at such a young age. He likened him to a footballer at his peak, sadly that was a stage of his career he was never destined to reach. The tragic events that took place at Munich airport on February 6th 1958 shook football to its very foundation. Manchester’s loss was felt all over the world. Duncan Edward clung on to life for 15 days after the accident. My mum, Eileen, recalls listening to the BBC radio news every morning. Edwards’ condition was the bulletin headline and everyone listened in hoping for some signs that the young footballer would pull through. On the 21st February 1958 Duncan Edwards lost his battle for life. He was just 21 years old. Edwards’ funeral at Dudley Cemetery was said to have been attended by more than 5,000 people – a measure of how he had been taken into people’s hearts. Years later football fans still talk about great players of the past. Duncan Edwards is no exception. In Manchester he is talked of as a legend – an amazing accolade for someone who was taken from the world so young with so much still to achieve. But what of Dudley, how do they remember their greatest son? Along with my travelling companions Ed, Phil and Glen, we go in search of Dudley Duncan. After walking into the town’s small market I ask one of the local traders for directions to Duncan Edwards’ statue and grave. He points us in the right direction and tells me that he was at the funeral. Despite the fact he was only 10 years old at the time his memories were very clear; it was an incredibly emotional time for the town and its people. Edwards’ statue stands proudly in the middle of Dudley High Street. We read the inscriptions and stand somewhat quiet. I’m not sure it was a planned silence. Perhaps we were trying to imagine what it was like for the people who had been lucky enough to see him play. The man at the market had told us that a further ten-minute walk along the Stourbridge Road is Dudley cemetery, the final resting place of our departed hero. The walk proves to be somewhat longer than the trader’s estimate. Ed by now is suffering from ‘If I walk another step’ disease and chooses to seek sanctuary in the Three Crowns. Glen notices the attractive advert for Guinness and joins him. For me and Phil the quest continues. We’ve come this far now there’s no turning back! 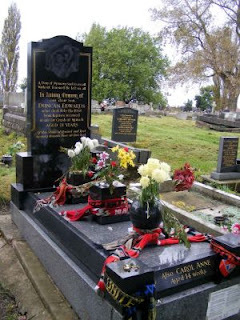 We finally arrive at the cemetery and ask the grounds keeper the way to Duncan Edwards’ grave. It is a question he has been asked many times. Football fans from far and wide, and not just the supporters of Manchester United, visit the monument. We locate the grave and once again find ourselves standing silent. Surprisingly the monument is not a big spectacular structure. Sure it is larger than some of the stones and decorated with scarves left by respectful United supporters. But despite Edwards’ considerable fame he remained one of the people. Perhaps the fact his monument did not overshadow those around him proved that he just wanted to be one of them? I turn to Phil and mutter, “I wish I’d seen him play”. However, I’ll have to settle for old newsreel footage and the memories of older folk. We make our way back to the Three Crowns where Ed and Glen are waiting. Four pints of Banks’ Best are ordered and talk turns back to the modern game. I’m sure Duncan Edwards would have been a star in the modern game, a claim with which the people of Dudley and Manchester will wholeheartedly agree!